Yes! You Can Freeze Gougeres! Can I freeze Gougères? You bet! Here’s how to freeze unbaked gougères or baked baked gougères. Both work! The French rarely bring out huge appetizer spreads before a sit-down dinner. The idea, instead, is to bring out a little bite that just stimulates the appetite. That is, an appetite-rouser rather than an appetite-douser. The classic French appetize-rouser is gougères—those wonderful little cheese puffs. And guess what? They freeze beautifully. Make a batch, and you’ll be able to bring them out, here and there, in the coming weeks. There are two ways to freeze gougères, and both work equally well. In fact, I just taste-tested the two different ways this morning and if someone made me choose one way over the other, I’d have a tough time telling which one was truly “best.” Okay, maybe I’d give the unbaked version a slight edge….but the baked version has the advantage of being ready to serve that much more quickly. First, follow directions for making gougères (here’s my recipe). Then, follow these instructions, either before baking or after. 2. Place the unbaked gougères on the baking sheet directly in the freezer. Freeze for 1 hour or until firmly frozen. 3. Place the firmly frozen Gougères in a freezer bag. Don’t worry, they won’t stick together in the freezer! Label the bag and freeze up to 1 month. 1. Prepare and bake the gougères as directed in the recipe. Place in freezer bags; seal, label and freeze for up to 1 month. 2. When ready to enjoy, place frozen gougères on a parchment-lined baking sheet and bake in a preheated 350°F oven for 6 to 8 minutes. Transfer to a wire rack and serve warm or at room temperature. I love freezing Gougères, because it lets you bring out just a few when you’re ready to enjoy a cocktail with whomever you spend your evenings with. Or if you’re serving a houseful, well, bring out the sparkling wine and a batch of these and everyone will be so very happy. My recipe comes straight from my book, The Bonne Femme Cookbook: Simple, Splendid Food That French Women Cook Every Day. Check it out! 10 comments to Yes! 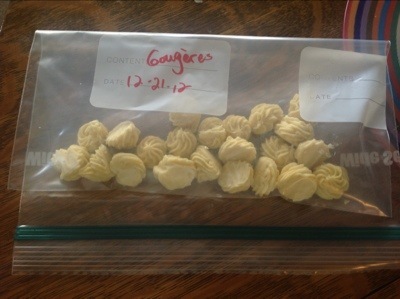 You Can Freeze Gougeres! Great idea! I love gougères!!! Enjoyed this posting. I first read about Gourgeres in one of Patrica Wells’ early cookbooks. It took years to get up the gumption/nerves to try this recipe–I was surprised at how easy, easy it is. Hubby & I now enjoy gougeres with cocktails just about every week! For just the two of us, I prefer freezing the baked gougeres. For guests, I bring out the unbaked from the freezer; like you, I think they are just a tad better. Thank you for transporting me back to France for a few minutes. 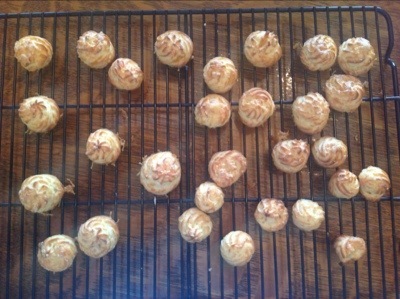 So nice to hear from you, Jan, and very good to hear a second opinion on the unbaked Gougeres! Thanks for posting. Thank you–so, when baking frozen Gougeres, what temperature is the oven? Thanks. Hello there. Simply follow the recipe as if you’re baking the Gougeres unfrozen. (They thaw really quickly). Preheat the oven to 400° F. Line a baking sheet with parchment. Place frozen uncooked Gougeres on parchment lined sheets. 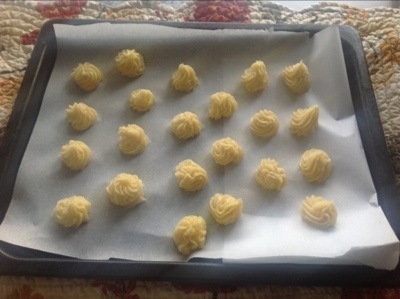 Bake the gougères in the preheated oven for 15 minutes. Reduce the oven temperature to 350°F. Continue to bake until golden brown on the outside, 8 to 10 minutes more. The insides should be dry but soft—pull one open to test it. Transfer to a wire rack to cool. Serve warm or at room temperature. Ha! Small world, Dilys. 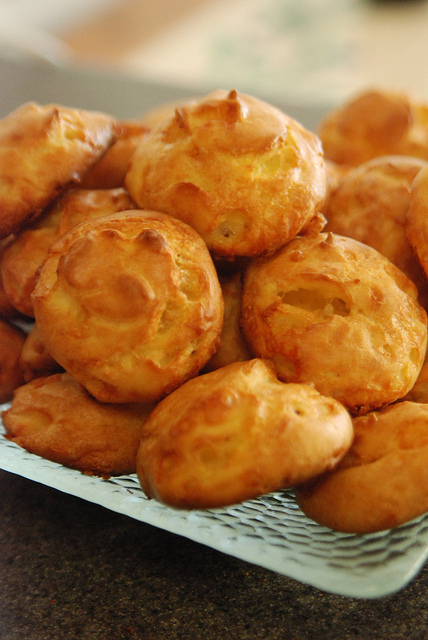 And truly, I think freezing the uncooked gougeres is the best way to go–it’s what I do most often! Enjoy. Please tell me what “an instant pot” is?? French food. I will get your books! An Instant Pot is an all-in-one cooker that works as a pressure cooker, rice cooker, and slow cooker, depending on the function. Check them out on Amazon. They’re amazing, though I doubt I will be getting one for myself. ‹ The Braiser Cookbook Is Now Available!